Popes have been interested in heresy and heretics for centuries, and language linking “papacy” and “heresy” continues to prosper down into our own day. The language root of “heresy” connects with “to choose,” and the heretic is someone who, in the eyes of someone else, makes bad choices. 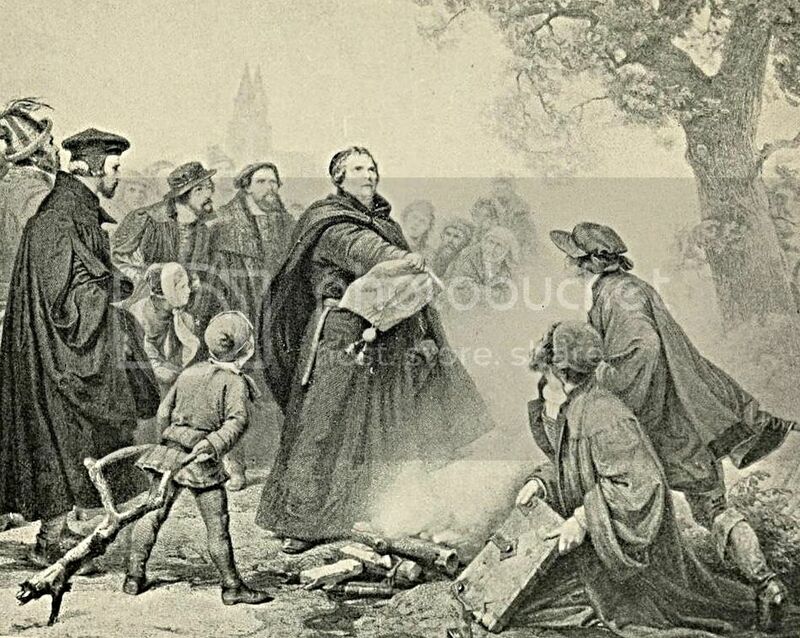 Those of us who are not of the papal obedience, particularly of the Lutheran tribe, will commemorate, this very Wednesday, the condemnation of Martin Luther, called a “heretic” on June 15, 1520. According to best estimates, .0001520% of the worlds Lutherans and even fewer Protestants and other heirs of the Reformation will be aware of this, or will observe the day. Never mind: the date provides us with an excuse to update dealings with the papacy and heretics. That is not the last word or the only approach to this subject from Pope Francis and, needless to say, Jesus. But it is the overlooked theme in a world of believers who are sure that they are always right and “the other” is always wrong, beyond negotiation, heretical, and worthy of equivalents of excommunication. Pope Leo X was sure he was right and Luther & Co. were wrong, and the pontiff’s language was not gentle. That pope’s “bull”—which we remind all, is a technical ecclesiastical term, spoke of the young and brassy monk Luther not as a raging bull, but a wild boar who had invaded God’s vineyard, the church. In case readers have been lulled by the pacific negotiator Francis, it is important to note that, surprise!, the pope is being declared heretical by people whose authority is invested in the internet. Sightings is appending numbers of links which will give readers a sense of what is being directed against this pope and two of his predecessors. We have not thought of Pope Benedict XVI or Pope Saint John Paul as heretics, but who are we to judge? We have thought of them as unassailably orthodox, but the quotable words from Catholics on the right, or the far right, or the far far right, do judge. Leo X found only 41 heresies in the excommunicable Luther, but some Catholic writers and leaders of the far right find 101 or more heresies issued from the Throne of Peter during the last three papacies. Many of the heirs of the “wild boars” in the vineyard are enjoying the spirit of Pope Francis, and will cite him in our celebrations on Wednesday, June 15. Scammell, Rosie. “Pope Francis: A ‘my-way-or-the-highway’ faith is heretical.” Religion News Service, June 9, 2016, Pope Francis. Pope Francis. “Those who say ‘this or nothing’ are heretics not Catholics.” Inside the Vatican, June 9, 2016, Morning Mass Homilies. “Heresies of ‘Pope Francis’.” Prophecies Book of Truth Blog, April 9, 2014. Dimond, Michael and Peter Dimon. “The Heresies of Benedict XVI.” Most Holy Family Monastery Blog. Accessed June 12, 2016. Pollock, Patrick John. “101 Heresies of Anti-Pope John Paul II.” Accessed June 12, 2016. For a virtual internet encyclopedia of “heresies” by the three most recent popes, see the NOVUS ORDO Wire Blog. http://www.novusordowatch.org/wire/index.htm. Testa, Stephen L. “List of Catholic Heresies and Human Traditions Adopted and Perpetuated by the Roman Catholic Church in the Course of 1600 Years.” Accessed June 12, 2016. Graves, Dan. “Pope Leo X Condemned Luther of Heresy.” Christianity.com, July 2007, Church History. To read Pope Leo X’s June 15, 1520, bull, “Exsurge Domine,” condemning the errors of Martin Luther, visit Papal Encyclicals Online. Accessed June 12, 2016. Image: from page 228 of "Martin Luther: the hero of the reformation 1483-1546 / by Henry Eyster Jacobs" (1906) published in New York and London by G.P. Putnam's Sons. Contributing library: Princeton Theological Seminary Library. Credit: Internet Archive Book Images / flickr creative commons.